Slide Show | Joined by a Border Life in Laredo, a city in Texas increasingly facing challenges in integrating two cultures. LAREDO, Tex. — The state’s standardized test approached like a spring storm, and Alina Quiroga knew her fourth graders could drown. Here at a school about a mile from Mexico along Interstate 35, most of her students rarely speak English outside class. Many, living with distant relatives, lack the confidence to speak up even in Spanish. Ms. Quiroga circled the room, her pearl drop earrings swaying, as the children read aloud about George Washington. “What does independent mean?” she asked at the end of the passage. “Alone?” one student responded. “Free?” another said. A view of Nuevo Laredo from across the Rio Grande River in Laredo. Laredo, a majority-Hispanic city since its founding in 1755, knows what it takes to incorporate immigrants. 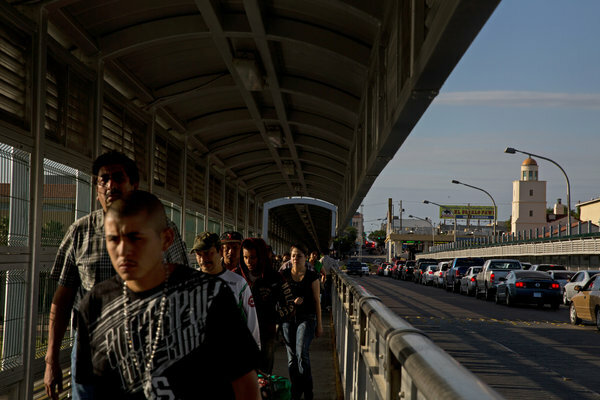 But over the past few years, as violence across the border in neighboring Nuevo Laredo has surged and as Border Patrol surveillance and checkpoints have made it harder to travel north of Laredo without documents, Laredo’s magnetic appeal has intensified, drawing immigrants who are testing local confidence, finances and the city’s bicultural equilibrium. Fewer Laredoans now go south to visit friends or shop, while more from Mexico land here, staying longer instead of just visiting or moving on. Some are desperate and willing to accept lower wages. Others push their children into public schools, setting them up with distant relatives who sometimes apply for food stamps if the children were born on the American side of the border, leading to complaints that Mexican families are more interested in benefits than work. The bigger worry is that in a city long known for its successful hybrid of Mexican and American cultures, the schools, churches and other institutions are underequipped, struggling to raise young Laredoans with the skills and attitude needed to fully succeed. Prekindergartners pledged to the American flag at Antonio M. Bruni Elementary, which is 99.9 percent Hispanic. On the national continuum of cultural and economic integration, Laredo’s challenges are extreme — it is the most Mexican of American places,96 percent Hispanic, with a bilingual population that often prefers Spanish to English. Its daily, difficult effort to meld two cultures, though, is one local version of an evolution occurring in many cities and towns nationwide, as it has become clear that immigrants are putting down permanent roots. Washington remains paralyzed, unable to agree on an immigration overhaul. But to understand the long-term effects and the more recent wrinkles of immigration, a New York Times reporter and photographer will explore what is happening at the community level by following the road that is Texas’ central artery and a main entrance to the American heartland: Interstate 35. Sometimes called “the Nafta corridor,” it traces over part of the Chisholm Trailused for 19th-century cattle drives and runs the length of the country’s middle, stretching north from here for around 1,600 miles to Duluth, Minn.
Interactive Feature | Do You Live Near I-35? Contribute to Our Reporting A New York Times reporter, Damien Cave, and photographer, Todd Heisler, are traveling the length of I-35, chronicling how immigration is changing the U.S. Where should they visit? Along the way, it edges close to classic Americana: the hometowns of Woody Guthrie, Jesse James and Donna Reed. Yet it also passes through what the country is becoming, from cities in Texas that have long been immigrant destinations to those in the Midwest that knew only black and white, or just white, until newcomers from Mexico, Bhutan or Sudan arrived to butcher beef or build houses. And for so many, it all started here — on a highway where, heading north, the first road crossed is named Washington, and the second Moctezuma. Rebekah Morales, whose family opted for something less traditional than a quinceañera, primped for her Sweet 16 photographs. The new cars and the heroin, the avocados and the immigrants: They all pass through here before heading up I-35 to Kansas City or Minneapolis. Especially since the passage of the North American Free Trade Agreement in 1994, Laredo has become a city of global commerce, with truck stops the size of stadium parking lots. But along with the legitimate trade — Laredo is the busiest commercial port of entry on the border, processing $98.5 billion in imports last year — comes whatever else the country desires or demands. Late at night, residents near the river often wake up to helicopters and squealing tires as drug smugglers try to outrun the American authorities. Immigrants, meanwhile, have come across in a variety of ways. Some have border-crossing cards that let them travel about 25 miles into the United States for up to 72 hours. Others were born in the United States, but stayed in Nuevo Laredo until the violence exploded about four years ago as the Gulf Cartel and the Zetas, rival drug traffickers, fought for territory. An unknown number have also come north as tourists or slipped across illegally. There has always been some of this — “We are joined by the border, not separated,” said Raul G. Salinas, the mayor of Laredo — and cultural mixing has been happening organically in the region for centuries. Even the city’s response to its first immigration surge, after the railroads reached Laredo in 1881, ended up as a hybrid: City leaders devised a celebration of George Washington’s birthday that included a mock battle at City Hall between “Indians and white men” in which the key to the city was given to Great Chief Sachem — Washington in disguise. Today, the celebration continues as an elaborate party, lasting for several weeks, starting with a welcoming ceremony on one of the international bridges, followed by a jalapeño eating contest and debutantes in $10,000 colonial gowns throwing beads from parade floats to gathered crowds. Residents describe it as a celebration of “Americanness” and a nod to Mexico. In the 1990s, that kind of friendliness was easier to maintain. Gradually, though, the pressures and opportunities of immigration spread. Some residents recalled seeing silhouettes of men with backpacks riding on trains heading north toward San Antonio. Downtown, at El Conejo, one of the first bus companies catering to Mexican immigrants, every bus going to Iowa or Kansas left nearly full as entire families moved north. Then suddenly the border tightened, first after 9/11, followed a few years later by a major border security expansion that added American officers, boats, cameras and checkpoints farther north on I-35. By 2011, after an especially bloody year in Nuevo Laredo, the distance between the two cities had become a canyon: Laredo’s Chamber of Commerce asked Texas to remove Nuevo Laredo from road signs denoting the distance to the two cities so people driving south might not associate Laredo with its neighbor. What used to be an almost-invisible barrier became an often-insurmountable obstacle. Every month at the county clerk’s office, about 20 people deliver notarized letters saying a fiancé lives in Mexico and is not allowed to come across, leading couples to marry on an international bridge or at the fence line. But as often as not, the process of becoming American seems to have slowed, or become less assured. From 1990 to 2012, Laredo’s population doubled, to more than 244,000, and about 30 percent of the city is now foreign born, maybe more as Central American immigrants have recently begun to appear in larger numbers. In some cases, fully joining American life means leaving. At boot camp, though, he discovered his English was not as good as he had thought. He had grown up on the grittier west side, where Spanish dominated. But, he said, Laredo is still a place where most people can join the American mainstream without giving up their Mexican roots, and as proof, he cited the names for his three sons: Tolbert Jr., Tristan and Timothy. Antonio M. Bruni Elementary, named after an Italian immigrant, is a squat brick building near a Roman Catholic church that pulls its 650 students from a district that stretches from the border through a neighborhood of old wood-frame homes tilting this way and that. Most of the children are American citizens. The school is 99.9 percent Hispanic and 99.3 percent economically disadvantaged, and nine out of 10 students speak English as a second language. If there is a school where the challenge of integration is more acute, its principal, Mr. Castillo, a conservative Democrat whose necktie never seemed to loosen, would like to know about it. His school is constantly in flux. Laredo’s two school boards after much debate successfully persuaded voters last year to approve bond issues for $533.7 million to deal partly with the overcrowding often associated with children arriving from Mexico. Some show up for the first or second grade having never attended school. Involved immigrant parents like Erika Gomez, 41, the mother of a fourth grader and a first grader, are a rarity. Last year, Texas labeled the school “improvement required.” This year, the school overhauled its curriculum, using English instead of Spanish for children in second grade and below. Maritza Lozano, 53, a prekindergarten teacher at Bruni with more than 20 years of experience, said she was reluctant at first. Non-Hispanics and Hispanics, in national surveys, have generally agreed that English should be a priority. Beyond that, there is widespread disagreement over what immigrants should do to become more woven into American life, or even what it means to be American. The latest New York Times poll, conducted May 7 to 11, with 1,000 adults nationwide, makes clear that the country is conflicted about its evolving identity. Most respondents, 65 percent, agreed that the United States is a country made up of many cultures and values, but that is not how most say it should be: 54 percent said it should be a country with a basic American culture and values, though a majority of younger people — under 45 — said it should be made up of many cultures. The United States also seems to be split over how immigration resources should be deployed. While 50 percent said the federal government should focus more on protecting the border and stopping the flow of illegal immigrants, nearly the same percentage, 46 percent, said government should focus on helping those who are already here become part of the broader society. At Bruni, the challenge is not what to teach, but how to teach it. Bruni’s per pupil spending last year was $5,932, below the state average of $8,276 and the national average of around $11,000.